Spears School of Business Cufflinks | Oklahoma State University by College Jewelry at Helix Alumni. MPN: C-140N1-SSA5. Hurry! Limited time offer. Offer valid only while supplies last. Spears School of Business at Oklahoma State University cufflink collection is designed to allow you to show your spirit in a classic and subtle way. 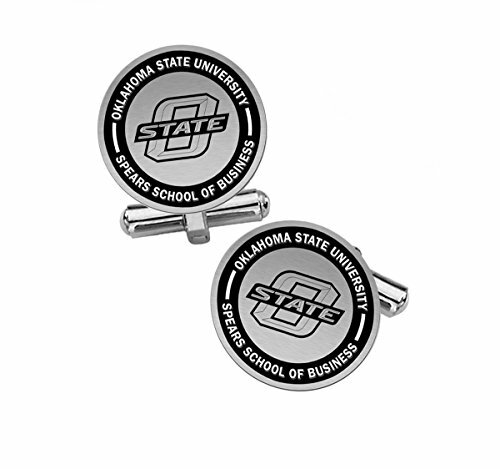 Spears School of Business at Oklahoma State University cufflink collection is designed to allow you to show your spirit in a classic and subtle way. Traditionally you see cufflinks that are constructed from materials that are designed to last a short time. These cufflinks are made with premium solid sterling silver with a thick top and deep engraving. You can have these cufflinks made with a black enamel background for contrast or a natural finish for a more subtle look. We use a combination of modern technology to mark the cufflink and traditional methods to hand finish. Once the cufflink is complete we coat the entire cufflink with a metal called rhodium to allow the cufflink to resist tarnishing. If you have any questions about this product by College Jewelry, contact us by completing and submitting the form below. If you are looking for a specif part number, please include it with your message.